The Twilight, seventh novel in the Collective Obsessions Saga, is now available in print. The paperback edition includes a cover designed by T.L. Davison. 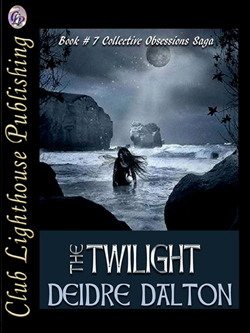 The release of The Twilight follows the first six titles in the family saga: The Advent, Quixotic Crossings, The Twain Shall Meet, Enthrallment, The Keeper's Journal and Hearts Desires. Under a new contract with Club Lighthouse Publishing, all eight novels in the Collective Obsessions Saga will become available as print-on-demand (POD) books on Amazon. Check Deidre Dalton's Twitter page for ongoing updates.